The PYMNTS.com Checkout Conversion IndexTM (CCI), in collaboration with BlueSnap, measures the payments conversion problems that arise when consumers encounter friction in their digital shopper experience. The CCI is based on a team of “shoppers” shopping at over 650 U.S.-based eCommerce sites across 14 merchant categories. We identified more than 55 attributes and used them to score merchants on how easy (or hard) going from discovery to final payment was on their site. 16 companies received an A, a 300 percent increase compared to Q1 2016. In addition, 13 sites that received a failing grade last quarter are now passing. Average checkout times were 21 seconds faster for all merchants than the previous quarter. 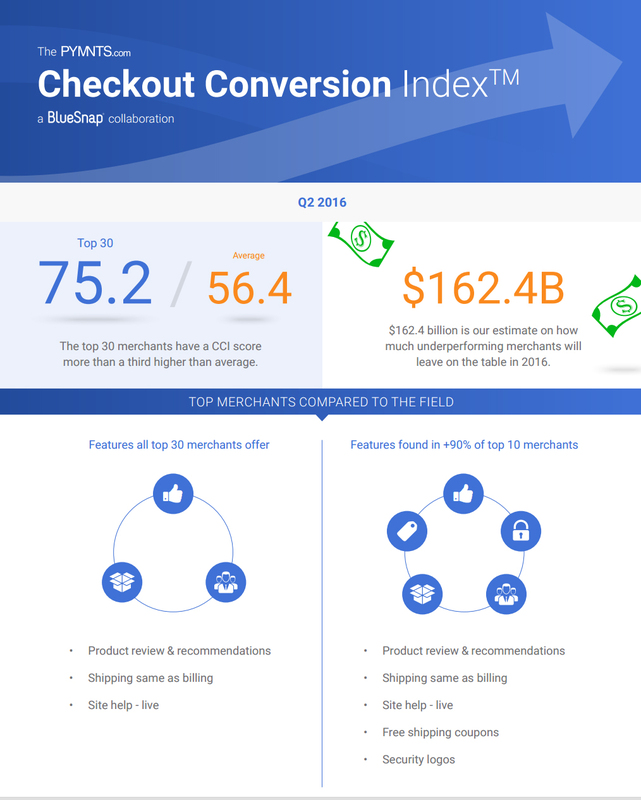 Among industries doing notably well in regard to eCommerce platform checkout conversion, Apparel and Accessories merchants climbed to No. 1 overall, beating mass merchants, which dropped to third position this quarter.